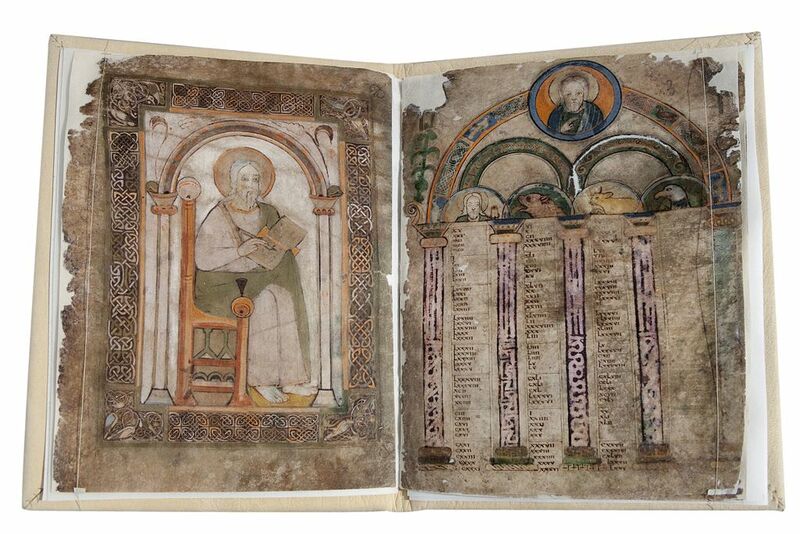 One of the most exceptional illuminated manuscripts from the 8th century has been digitized and is now available online. The Codex Eyckensis, a Gospel Book from the treasury of Saint Catherine’s church in Maaseik, is the oldest preserved “book” produced in the Low Countries. This early Carolingian Codex was produced around the year 760, during the early stages of Christianization in the region. It is presumed that this Gospel Book was written in the scriptorium of the Abbey of Echternach and that it was brought to the Abbey of Aldeneik by Saint Willibrord himself. There it was preserved and worshipped in the context of the adoration of Saint Harlindis and Saint Relindis. In the year 1571 the Codex Eyckensis was moved from the Abbey of Aldeneik to the crypt of Saint Catherine’s church in Maaseik, in northeast Belgium, where it has been kept and preserved ever since. Under the leadership of Professor Lieve Watteeuw and in cooperation with the Katholieke Universiteit Leuven Imaging Lab (Bruno Vandermeulen) and with the KU Leuven Illuminare – Centre for the study of Medieval Art, the Codex Eyckensis was accurately digitised at very high resolution. A mobile digitisation lab was set up at the church treasury to enable the manuscript to be examined and photographed on site and in optimal circumstances. Click here to view the manuscript online. In addition to the Codex Eyckensis, there is another, lesser-known 10th-century Gospel Book held in the depository of the Maaseik Museums. This manuscript has been digitised and made available – click here to access it. To extend this improved availability to the international level, access to the digitised Codex Eyckensis will be provided via the portals of Europeana and Erfgoedplus, and through www.museamaaseik.be.